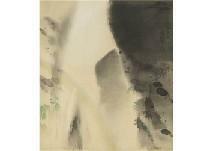 Find artworks, auction results, sale prices and pictures of Shinsui Ito at auctions worldwide. 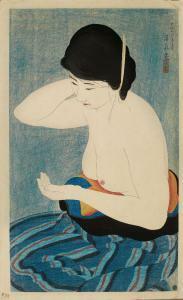 Ito Shinsui (1898-1972) In Broad Daylight (A Summer Midday) Woodblock print, signed and sealed Shinsui, published by Watanabe Shosaburo 15 x 10 in. (38.1 x 25.4 cm.) Provenance The child prodigy Ito Shinsui was discovered at a young age by Watanabe Shozaburo (1885-1962), founder of the shin-hanga movement and publisher of this print. 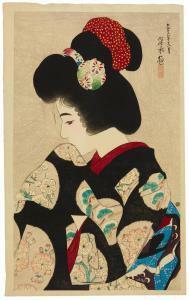 Shinsui was a pioneer of shin-hanga, producing full-scale paintings which were then translated into woodprints by dedicated craftsmen. While beautiful young women (bijin-ga) dominate Shinsui\’s more commercially successful prints from 1922 onward, scholars have pointed out that his earlier, unconventional landscape prints share the experimental qualities of sosaku hanga. The meditative In Broad Daylight (Mahiru, October 1917) was inspired by the following haiku-like record of a personal, momentary impression of an ordinary landscape: The column of white cloud rising into the blue sky of early summer was impossible as it shone in the full sunlight. There was a farmer completely focused on this work in the raised wheat field. It was just after noon. Rainbow ITO Shinsui (a set of 2) 1928, color on silk, paper board size 27x24cm, signed and sealed, with an authenticity certificate by Tokyo Bijutsu Club, with a sticker of HAMADA Taiji, this lot accompanies another work; 【Snowing】(woodcut, 33.3x21.8cm, signed and sealed on plate), both are framed. 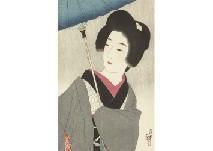 Scattered shower ITO Shinsui (a set of 4) woodcut, 33.3x21.4cm, signed and sealed on plate, this lot accompanies other works; KOBAYASHI Kiyochika【Ueno Toshogu in Snow】(woodcut, 20.8x32.4cm, signed on plate)【Landscape】(woodcut, frame window size 19x29.7cm, signed on plate) KAWANABE Kyosai【Weasel and Rooster (reproduction woodcut)】(18.5x26.3cm, signed and sealed on plate, published by Unsodo), three of them including the titled work are framed.